The golden monkey has brought New Year blessings. 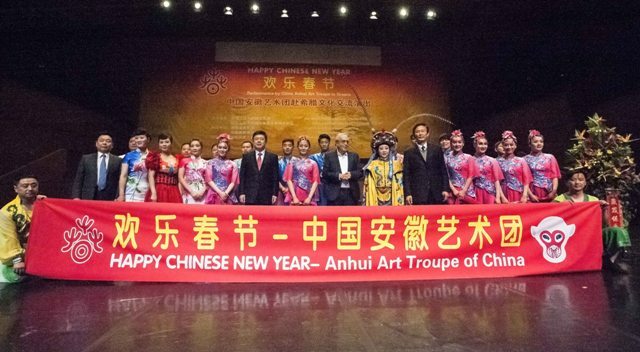 On January 27, "Happy Chinese New Year"-performance by China Anhui Art Troupe was staged in Megaron. Over 2000 people watched the performance including Chinese Ambassador Zou Xiaoli, Mr. Costas Simitis, former Prime Minister of Greece, Mr. Arisidis Baltas, Minister of Culture and Sports, Vice-chairman of the Diplomatic and Foreign Affairs Committee of the Hellenic Parliament, Secretary-General of the Ministry of Shipping and Island Policy, Secretary-General of the Ministry of Economy, Chairman of Taiped, the Deputy Chief-of-staff of National Defense, representatives of the Diplomatic Cabinet of the President of the Hellenic Republic, Diplomatic Cabinet of the Prime Minister, Diplomatic Advisor's Office of the President of the Hellenic Republic, the Hellenic Ministry of Foreign Affairs, the General Secretariat for Information, major political parties, local governments as well as over 20 diplomatic envoys, representatives of friendship organizations between China and Greece, and Chinese institutions and overseas Chinese. 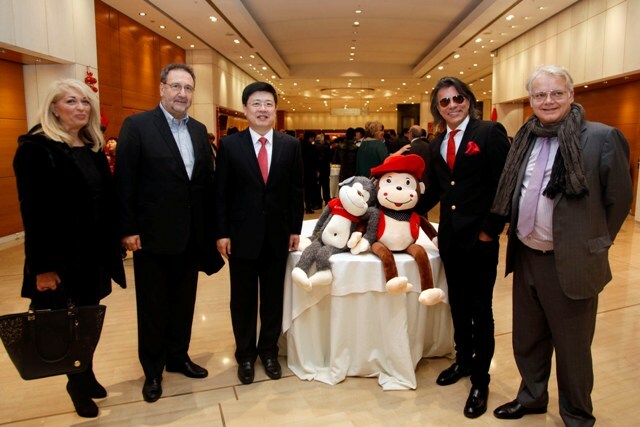 In his address, Ambassador Zou Xiaoli said that the Chinese New Year, the year of the monkey, which falls on February 8 this year, will be of great significance for the development of China-Greece relations. This year marks the 10th anniversary of the establishment of comprehensive strategic partnership between China and Greece. There will be a series of high-level visits, which will bring mutual trust and cooperation between the two countries to a new high. China will expand investment in Greece, especially in ports, ship building and maintenance, and logistics. The two countries will build the China-Europe Land-Sea Express Route to connect the maritime Silk Road with the Silk Road on land. The Chinese Cultural Center in Athens will begin to operate, which will add another important platform for the two ancient civilizations to conduct cultural exchanges and enhance friendship between the people. The Asia-Europe Scientific Innovation Conference will be held in Athens. As coordinator for Asia and Europe respectively, China and Greece will jointly promote cooperation in scientific innovation. 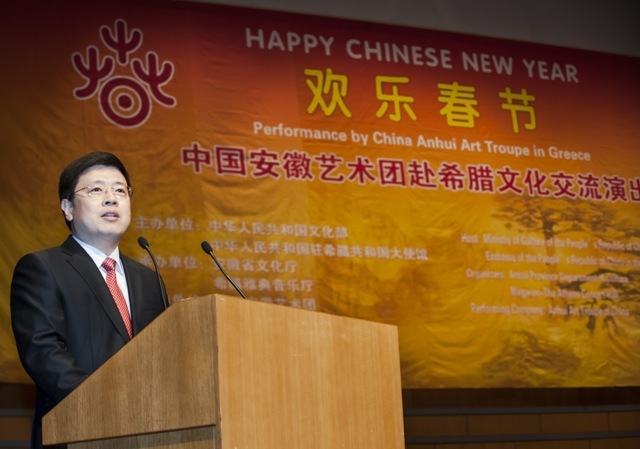 The year 2016 will be a year of cultural exchanges and cultural industry cooperation. The purpose is to combine rich cultural resources of the two countries with trade and investment cooperation so that culture and economy can reinforce each other. Chinese tourists to Greece are expected to continue to grow markedly. Air China will upgrade the flights between Beijing and Athens with larger and newer planes starting from June 1. The relevant authorities of both sides will adopt new measures to enhance cooperation in tourism. China and Greece will enhance coordination and cooperation in regional affairs to jointly deal with challenges and safeguard regional peace and stability. Ambassador Zou pointed out that China and Greece are not only friends who help each other in difficult times but also partners for common development. The two ancient civilizations have created splendid histories and will march together hand-in-hand, fearless of difficulties along the way. 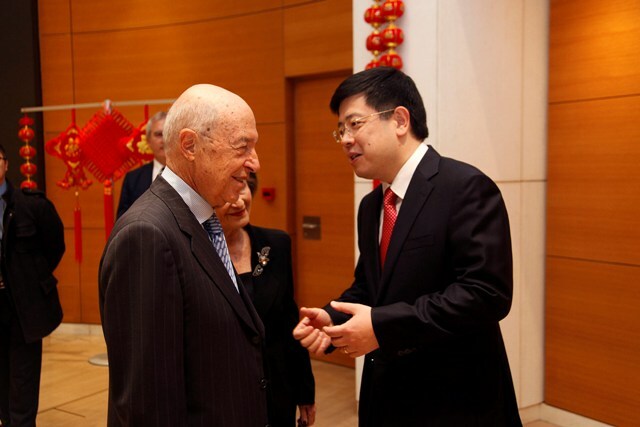 He believed that in the new year, friendly cooperation between China and Greece will continue to enjoy vigorous support and active participation from both countries and usher in fruitful results. 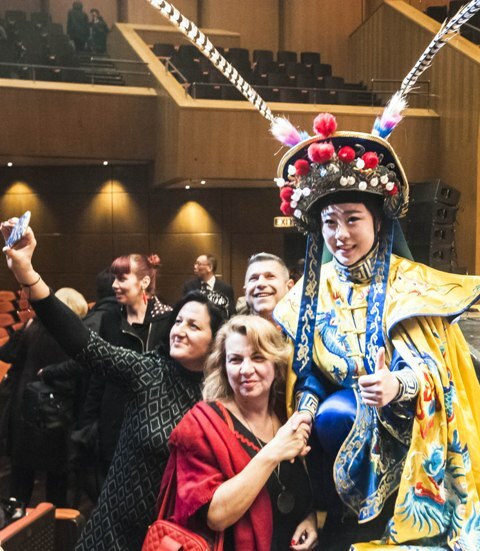 China Anhui Art Troupe presented a performance of strong local features including Huagudeng, Huangmei Opera, Fengyang Huagu, Liuqin Solo, and Acrobatics. After its performance in Athens, China Anhui Art Troupe is going to give another performance in the famous coastal city of Patra.